This psalm opens with verses that I’ve thought couldn’t possibly be in tune. There was no way that these words could conceivably be in tune with the song that God is singing. I read these “how longs” of verses one and two and wondered... how’d they get in here? 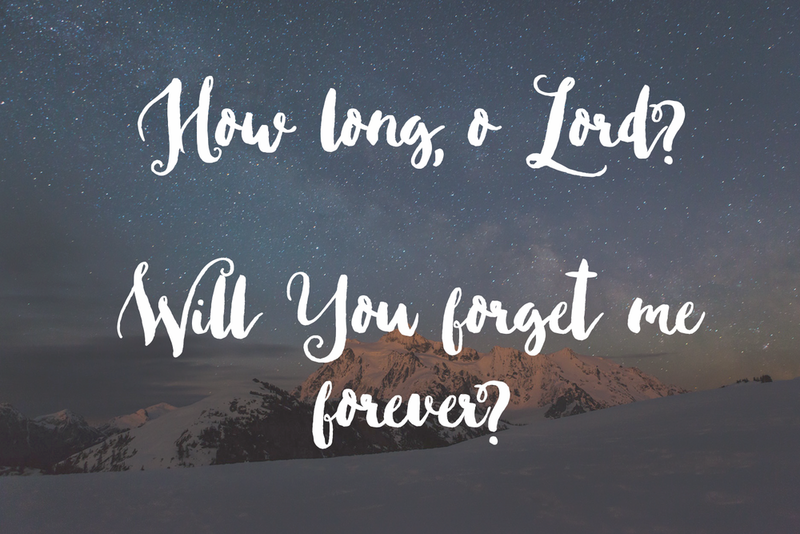 How long, O, LORD? Will You forget me forever? How long will You hide Your face from me? How long shall I take counsel in my soul, having sorrow in my heart all the day? How long will my enemy be exalted over me? Psalm six: My soul is greatly dismayed; But You, O LORD -how long? Return, O LORD, rescue my soul; Save me because of Your lovingkindness. Psalm thirty-five: Lord, how long will You look on? Rescue my soul from their ravages, my only life from the lions. The minor prophet Habbakuk opens with these words… How long, O LORD, will I call for help, And You will not hear? I cry out to You, "Violence !" Yet You do not save. And this wasn’t just the question of the psalmist or the prophet, not just the experience of the individual: “How long, Oh Lord?” overwhelmed even the nation of Israel. For over 400 years they wrestled with the apparent hiddenness of God as slaves in Egypt...crying out to God for salvation yet no response. And we all know these feelings, don't we? Forsakenness, desertion, being forgotten…we know the feelings of intense longing, desolation, the wondering if things will ever get better. The moment we read these words we hear the voice of someone else, crying from the forsakenness of the cross, right? Jesus the Son of God, sinless Savior. He asked for a way out of Gethsemane, a way to avoid the Father’s cup…but His plea fell on deaf ears…yet not my will but thine. At Calvary, He endured the "long dark night of the soul"… He who was the beloved Son, the perfect and holy one. His cries went unanswered, darkness overtook him, He was cut off from the Father…How long, oh Lord? So this thirteenth Psalm - these verses that I have prayed myself and once previously believed to be so out of tune with God's song...I find that perhaps they are not so far off after all. I’m beginning to see that how long is not out of tune at all. I sing to the Lord, I cry out and beat my chest and I am in good company. I don't need to find a new song when the night seems long. I don't have to "be okay" with the tension of waiting - I can sing this seemingly out-of-tune song, because I see now that even God's own Son sang and wondered and endured.